The FMF Turbine Core II Q Silencer is top notch and has well earned its U.S. Forest legal status. 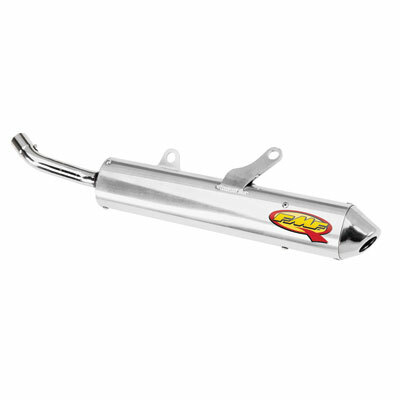 The Turbine Core II Q Silencer has a straight through design of the spark arrestor canister and the performance ensures strength, durability and the most important, track and trail proven unrestricted power. The FMF Turbine Core II Q Silencer is designed to enhance the sound absorption qualities and the results of excellent power and sound deadening characteristics. The new patented Q silencer addresses spark and noise conformity issues by offering unmatched noise reduction in a 2-stroke spark arrester with a minimum reduction in power. Features the new "turbine dampening separator" which eliminates the restriction found on most spark arresters.